Dreams in Stone - the palaces of King Ludwig II of Bavaria: Neuschwanstein, Linderhof and Herrenchiemsee is part of the Tentative list of Germany in order to qualify for inclusion in the World Heritage List. I visited two of the three castles in this serial property ages ago. They likely deserve full WH recognition purely on the strength of the world-wide fame of Neuschwanstein. Just type "most famous castles" into Google search - and literally the very first picture on top will be that of Neuschwanstein. The purported inspiration for Disney does look incredibly fetching from distance, but the closer you get to it the more it feels contrived. An over-the-top concoction of a mad king who never got to enjoy his creation. Neuschwanstein is a pretty damning artifact of the royal excesses of the 19th century, but the lack of any other historic significance makes it all the more a theatrical decoration with little substance. My friends who resided in Bavaria at the time advised me to skip interior tour of the castle, since none of the spaces inside were considered remarkable. I followed their advice, spent a bit of time in the main castle courtyard, which was accessible without a ticket, and then went to and lingered on the Marienbrücke, taking in the iconic perspective of the castle. Afterwards I drove to Linderhof. The shortest driving route crosses into Austria and goes through delightful Alpine scenery. Linderhof is a proper royal retreat, with a large park full of impressive features, such as the Venus Grotto, a couple of elaborate fountains, and a few other structures worth checking out. The palace itself has relatively intimate dimensions and just a few rooms, sufficiently opulent to dazzle. The guided tour lasted just about half an hour and then I had free run of the park (visit to the grotto was only allowed with a timed guided group). In mid-May, on a cool weekday, arriving at Linderhof in the early afternoon, I did not encounter a large number of fellow visitors - certainly nowhere near the number of people that I had encountered that same morning at Neuschwanstein. Even adding a possible interior guided visit of Neuschwanstein, it is entirely possible to see both it and Linderhof on a single day-trip from Munich. The third palace on the list, Herrenchiemsee, was not on my itinerary when I toured Bavaria back then, and I have not managed to return to the area since. Its distance from the other two - and its location on an island in the middle of a lake (which obviously will require a bit more effort to reach) - suggests that seeing all 3 palaces in one day would be a stretch. Herrenchiemsee would require a separate day-trip from Munich. I finally managed to visit all 3 castles. All of them, especially Neuschwanstein, don’t really need the title for touristic reasons. 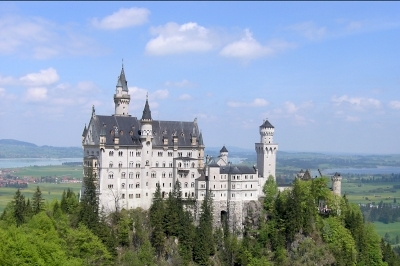 About 1.5 million visit Neuschwanstein each year. The other 2 castles combined see about the same amount of visitors. Still I personally think need to be on the WH list. It has the most spectacular location and structure. The castle was inspiration to the Disney Castle. Getting there is pretty easy. Use the highway until Füssen. It’s a short drive from there. The interior of the castle is not too spectacular. You are only allowed to enter by guided tour and no photos are allowed. You can easily visit Hohenschwangau close to the castle (not part of the T-List) and the Wies church. 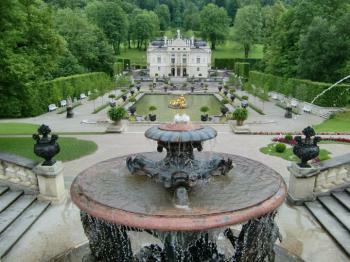 Schloss Linderhof is the only place where the king actually lived. It’s rather a big house, with nice Baroque and Rococo interior. It has a nice garden and some additional features, like water plays and an artificial cave. Visit in summer. I had my second visit this March (2016) and the cave was closed, all fountains were dry and all statues hidden under massive wooden boxes. Tours only guided and no photos allowed inside. It’s about a 1 hour drive from Neuschwanstein. The biggest of King Ludwig’s castles is an unfinished attempt to copy Versailles. Like so many others in Europe. It’s the biggest of the castles with the most impressive interior, but the Versaille-like dull exterior. The castle is built on the Herreninsel, the biggest island of the Chiemsee lake. Drive to Prien am Chiemsee and take the boat there. Prien is 1-1.5 hours by car from Munich. Water plays only work in summer. Tours only guided and no photos allowed inside.